Home » Archive by category "Estate"
The cattle you see today grazing serenely beside the River Avon, hornless with hides polished jet black, are descended from the herd first started by Sir George Macpherson-Grant in 1860, and are now the oldest surviving bloodlines of Aberdeen Angus in the world. Black, hornless cattle had been grazing the Highlands since the 12th Century. From the 16th Century onwards various types of hornless cattle were being bred in the North East of Scotland. By the late 1700s two local breeds had come to prominence: the old ‘Doddies’ of Angus and the ‘Hummlies’ of Buchan. Both breeds have a strong claim to being forerunners of the Aberdeen Angus. Their pioneering work was taken up by the 3rd Baronet of Ballindalloch, Sir George Macpherson-Grant who, upon inheriting the Estate in 1861, set about the refinement of the breed: a labour of love that was to become his life’s work for almost half-a-century. Today the Aberdeen Angus is one of the most recognisable and popular beef breeds in the whole world. 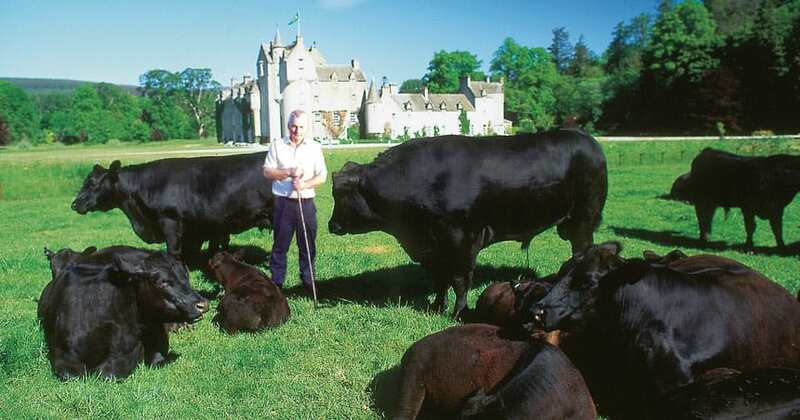 If you would like to know more about the Ballindalloch herd, or to visit, then please go to the Estate website.